For many people, the best place where they work from has become their home. There are a lot of reasons, freelancing, medical condition, remote work, or simply the fact that you prefer to work from home and you do it that way. Whichever the case is, a home office should be a balance between comfort and functionality. Keeping this in mind, here are some tips which can help you to set up your home office. There are many rooms in your home, and for the home office purpose, try to choose the one which is most suitable. Suitability depends on your nature of work and also the surroundings. Try to choose a room which has the least possibility for having noise and other distractions. Check to see if the room has proper ventilation and sufficient natural light passing or not. Try to choose a room with a window which will add to the aesthetic and also work as a refreshing element while you work. The natural light helps to spark creativity as well as makes the room enlivened with a touch of nature. Colours affect our psychology a lot. Find out your colour of liking, a colour which makes you feel calm, relaxed and focused. Try to have that colour on the walls of your home office. This will make you feel totally comfortable and will help you get into the zone. For example – Cool Blue and white are comforting colours. Prolonged periods of work puts stress on your body and mind. To look after your body, be sure to put the laptop at a comfortable height so as to not hurt your wrist and fingers. Fatigue over a long term can cause muscle pain, and even worse issues like carpal tunnel syndrome. Your hands should be parallel to the floor when typing. Your eyes should look straight into the screen surface, without having to slouch your neck downward or push it upward. Most importantly, the chair on which you’ll be working the whole day should keep your spine straight and comfortable. Let your feet rest on the floor firmly. Do not skimp on this matter as it will affect your posture. If your task requires you to print frequently; buy a printer. Invest in a good computer (preferably desktop) and have good quality keyboard, mouse, and a UPS or surge protector (for desktops) for saving your computer from shutting down suddenly and losing work. Don’t forget to personalise your workspace with your favourite items. It can be a guitar showpiece or that desktop plant you like. You can also have something to free your mind, like a dartboard or whiteboard for drawing. This will help to think creatively, brainstorm ideas and remain functional. Cabling can be a nightmare, so try to arrange them and keep them as organised as possible. Keep space for moving and cleaning. You may seek some professional help so that the whole internet connection and cabling process can be done smoothly. 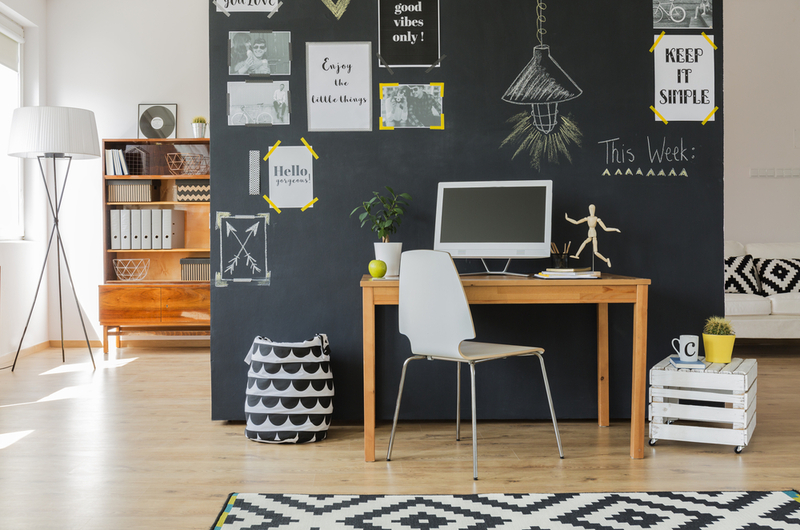 There are a lot of ways to make a stunning home office, these are the basics. Some prefer to have a TV in their workspace, though that comes down to personal preference and need. However, for any kind of cabling needs, it’s better to get professionals to do it.